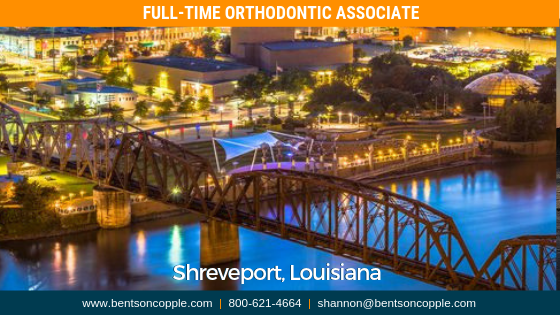 A multi-location practice located in Shreveport, Louisiana is seeking a full-time associate to join their smile team. The community parishes that comprise the area offer its residents wonderful cultural attractions, year-round festivals, and an array of outdoor activities. On the city’s beautiful downtown riverfront, you can find the Shreveport Aquarium, which is a state-of-the-art facility that opened in 2017 marking a new era in the ongoing revitalization. Living in Shreveport offers residents a suburban feel and is a great place for business, scoring a spot on CNN Money’s List of America’s Best Places to Find a Job. Located on the banks of the Red River, Shreveport is also the commercial and industrial center for a three-state region (known as the Ark-La-Tex). If you are interested in providing the highest quality orthodontic care in a friendly community, please forward your CV and letter of interest to shannon@bentsoncopple.com. Ideal candidate is available by summer 2019 and eligible for Louisiana licensure.